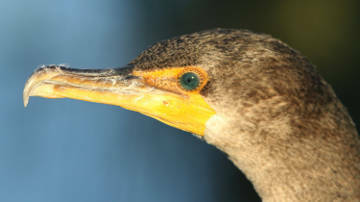 A close-up view of a double-crested cormorant shows its fearsome hooked beak, beautiful green or turquoise eyes surrounded by orange skin, and bright yellow-orange throat. What are those black birds out on Westborough’s Mill Pond? Every spring someone asks this question. You might see the large dark birds in question perching quietly in the standing dead trees in Mill Pond. Or you might notice them on old logs and stumps that barely poke up out of the water there. (Mill Pond is also known as Stump Pond for its many underwater stumps, or as SUASCO, a flood control reservoir for the SUdbury-ASsabet-COncord watershed.) These birds perch with an upright posture. Some of them might have their wings stretched out to dry – something we don’t usually see other birds doing. These mystery birds are double-crested cormorants (Phalacrocorax auritus). They’re a kind of water bird. Looking from shore, people sometimes wonder if they’re crows, but cormorants are much larger (almost 3 feet long with a wingspan of more than 4 feet) than crows. And they’re mostly silent, very unlike the noisy crows. Cormorants also have webbed feet, but we can’t see this from shore. In a close-up view, you would see that double-crested cormorants have the fearsome hooked beak of a predator, beautiful green or turquoise eyes surrounded by orange areas, and a bright yellow-orange throat. We tend to see double-crested cormorants when they migrate along the coast and through our area in spring and fall. They’re fish-eaters, and they find Mill Pond a fine stopping-place on their journey. The pond has plenty of small fish of the best size (6 inches or less) for them to catch, as well as dead trees and logs where the cormorants can rest when they aren’t in the water fishing. Adult cormorants eat about a pound of fish per day. Cormorants fish by diving, but it’s hard to see the action from shore. They typically dive from the surface of the water while they’re floating there, or sometimes from a low perch such as a log. (You won’t see them diving dramatically from the air like the kingfishers, ospreys, or bald eagles we might see fishing on local ponds). They can dive 5-25 feet – a depth suitable for Mill Pond, which is only 3-15 feet deep. They typically stay down for 30 seconds or less, but they can submerge for as long as minute. Their webbed feet speed them along under water as they pursue their prey – often schools of fish. Their feet are positioned for speed, far back on their bodies. Their large hooked beaks help them grab fish. They swallow most fish underwater, but they’ll bring a large fish to the surface and toss and catch it until it points head-first down their throat. Cormorants also sometimes play by tossing fish or small stones. One surprising reason cormorants dive and swim so well underwater is that, unlike ducks and most other water birds, their outer feathers are not waterproof. (That’s why they need to stretch out their wings to dry in the sun and air.) What good are non-waterproof feathers for a water bird? Such feathers make cormorants less buoyant, so it’s easier for them to dive and stay down. The structure of their outer feathers (on a microscopic scale) allows them to get soaked. The many small branches that make up the feathers are not hooked tightly together, so water seeps between them. If you spot a cormorant in the water, you’ll probably notice that it rides low in the water and holds its head and beak tilted upward. You can recognize cormorants by this pose. And sometimes, instead of diving, a cormorant will simply sink lower and lower as it swims until only its head and neck are visible, and then even lower until all of it disappears underwater. How does this predator manage to see the fish that it chases underwater? Double-crested cormorants have eyesight that is suited for an underwater environment. Like almost all birds, they have a third eyelid, which is transparent. When cormorants close it, this eyelid protects their eyes underwater, much like goggles. Better yet, this clear eyelid has a special center that works like glasses to help cormorants focus underwater. Cormorants also have strong eye muscles for focusing the lens in their eyes. Where does their name come from? Double-crested cormorants are named for the small dark plumes that grow on their heads in the breeding season. These feathers are hard to see, especially from far away, so we usually don’t even glimpse them. In Massachusetts, double-crested cormorants breed only on islands off the coast. The cormorants that visit Mill Pond are probably on their way to island breeding sites farther north. Near their nests, cormorants do make some sounds, kind of like grunting. Where else might you find double-crested cormorants? Another freshwater site in our area is Wachusett Reservoir. Double-crested cormorants also fish in salt water, so you can often see them along the coast. (Near their eyes they have salt glands that rid their bodies of salt by producing a liquid that is saltier than seawater and drips off the end of their beak.) At the coast you might also notice their relative, the great cormorant (Phalacrocorax carbo). It fishes only in salt water and is somewhat larger, with a white throat and white belly. Double-crested cormorant populations have a checkered history, both in Massachusetts and elsewhere in the U.S. Bones found in Native American middens (garbage heaps) from around 1500 show that double-crested cormorants bred on the Boston Harbor Islands back then. By the early 1800s, however, cormorants had stopped breeding in Massachusetts. A likely reason was persecution due to the widespread belief that cormorants were taking fish that would otherwise be available for human consumption. The cormorant population began to grow in the 1900s, and cormorants started breeding again on the offshore islands of Massachusetts in the 1940s. Then after World War II, when DDT began to be used commercially, their populations again declined. Double-crested cormorants were one of the first species to suffer from eggshell thinning as a result of DDT use in the environment. Cormorants with deformed, crossed bills were observed in Massachusetts and elsewhere. Once DDT was banned, double-crested cormorant populations increased everywhere in the decades after 1975. More recently, however, Mass Audubon’s State of the Birds (2011) report noted a 19 percent decline in their population over 12 years. Double-crested cormorants remain the subject of controversy, especially in places where they hang around in large numbers. On one hand, they are often viewed as pests that consume too many fish and interfere with commercial and sport fishing. A newer concern is that large numbers may leave enough droppings to alter the soil and kill trees that grow in it. On the other hand, as top predators in a food chain, double-crested cormorants are regarded as birds whose health can serve as sign of the health – or lack of health – of our environment. For us, double-crested cormorants inspire curiosity and prove to be interesting native birds that pass through our local environment on their spring and fall migrations.